ScotDrakula have always been great at blending contemporary indie-rock and blues with low-end throb and up-tempo battering. If this sounds like an unfeasible combination then you can probably see why many see them as a rare and exciting commodity. I’ve waited for ScotDrakula to release an album for a while, alongside the ever-growing fan base of the Melbourne trio. Since their first EP, CRACKSTRENGTH, the group have managed to emit unpolished clang and throb with exact precision. Their rough-hewn rock and roll has always been rhythmic and recusant – throwing a shaka with one hand and raising a challenging fist with the other. Even at their most stripped back and sluggish, ScotDrakula have always had a pulse, one that beats with purpose. Their debut, self-titled album maintains the thrumming surge of previous releases, but contains more polished verve thanks to a bit of extra spit-n-shine. To me, ScotDrakula have seemingly had a constant sense of paranoia about them, thanks mostly to Matthew Neumann’s tightly wound vocal and lyrical contributions. Even the songs with sunny dispositions held a sense of unease – or at least wariness – of the world it inhabited. ScotDrakula the album continues this trend and is a very world-conscious record, one that casts an observant eye over society and transcribes everything it sees. Matthew’s chat with Mess + Noise confirms this, with observations about human nature, the armed forces, police and consumerism. The eye also turns inward and examines the inner-happenings of the brain and psyche. Although ultimately self-referential and based on his own thoughts and ideas, Matthew Neumann’s lyrics strike home on many of the topics he addresses; the leitmotif of the album is a permeating distrust of consumerist bodies as well as certain law and order institutions but also of the mind. The sound on this album is impeccable. I levelled a criticism at the band when they released ‘O’Clock’, the first single for ScotDrakula. Marking it as a departure of sound from previous releases, I mentioned that it lacked the oomph that was prevalent in tracks like ‘Break Me Up’. ‘O’Clock’ is a departure from previous sounds, but the entire record contains enough visceral eruptions to placate my pedantry regarding the beat and bass. Second single, ‘Shazon’ is probably my least favourite track though – the main refrain is a little too repetitive for me. ‘Booth In The Mall’, ‘Pig Eyes’ and ‘Starter Humanism’ are highlights, as is the slightly re-tooled ‘Break Me Up’, thankfully added at the tail end of the record. ScotDrakula have always been great at blending contemporary indie-rock and blues with low-end throb and up-tempo battering. If this sounds like an unfeasible combination then you can probably see why many see them as a rare and exciting commodity. 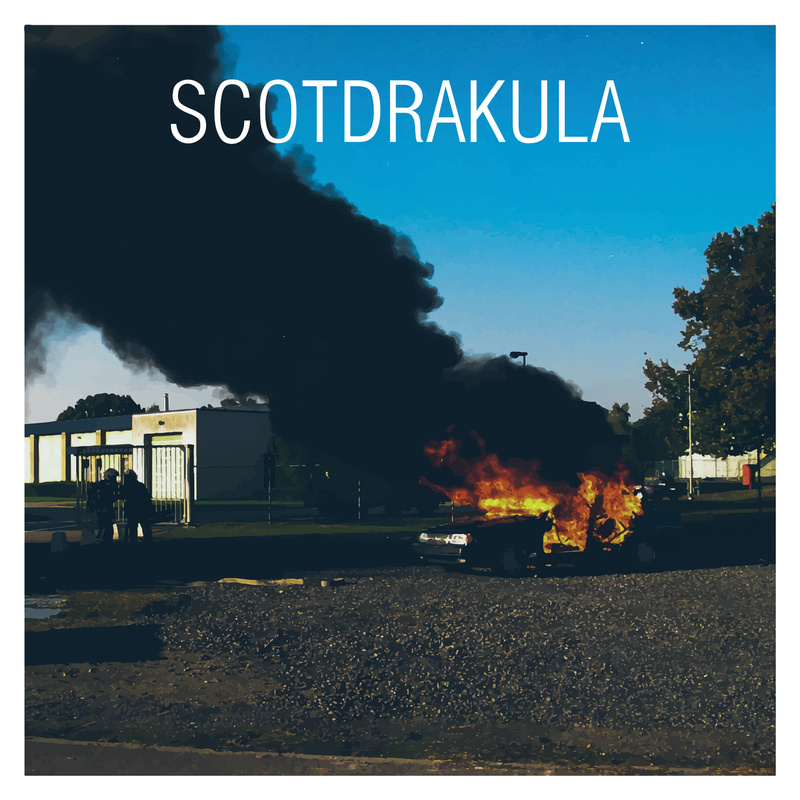 Although there is more of a discernable sheen on this record that puts their sound towards the sunnier spectrum of the underground, the social distrust and relatable stories that ScotDrakula relay is still as edgy as always. Whether conveyed with a vocal chord tearing shriek or a rapturous group harmony, the band can always make their feelings known. ScotDrakula is worth copious amounts of praise, not just with its musical arrangements, but by conveying a sonic-form fleer so eloquently.